Each and every NFL season, the Madden video game title brings debates amongst football fans before the season begins. It not only has fans in the debate but often the players themselves ponder on social media why they have the ratings they do. 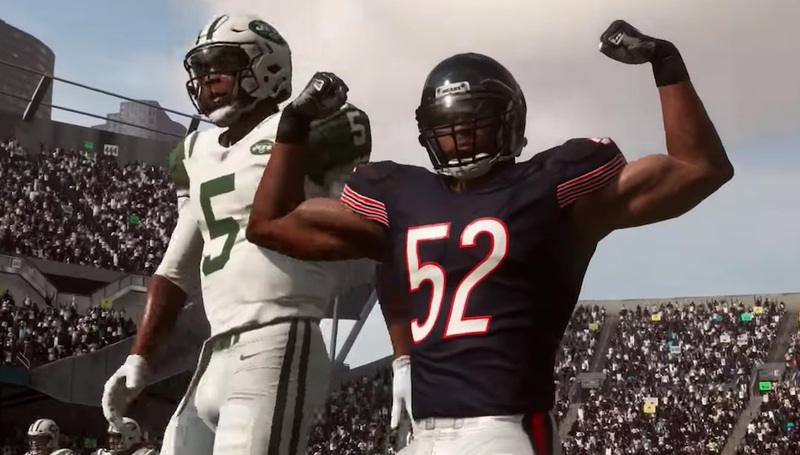 Luckily, there are ratings adjustments made through the season, and now Madden 19 player ratings reflect how players performed this past season. The 99 Club is an elusive club within the Madden game, as it is the best-possible rating that players can have. Heading into Madden 19, cover athlete Antonio Brown and defensive star Aaron Donald were among stars with these ratings ahead of the season. Both players also managed to keep those ratings intact, while others slumped and fell out of the club. However, two other players were able to gain entry to that 99 Club with their stellar performances on the field. Both were on the defensive side of things too. One was the Chicago Bears’ Khalil Mack who was an absolute beast for the Bears in their successful season. Mack finished out the season with 99 Awareness, 96 PMV, and 92 BSH amongst his high-rated skills. For perspective’s sake, he started the season as only a 95. The other new club member was the Seattle Seahawks’ Bobby Wagner. He’s considered the best middle linebacker on the field today and is quite deserving of that 99 as well. His top skills included 99 Tackle, 98 Hit Power, and 99 Awareness. He was part of a Seahawks team that got into the NFL Playoffs as well. Interestingly, Patriots quarterback Tom Brady was a 99 at launch and a 97 after winning the Super Bowl. Having that 99 rating may not be everything. It should be interesting to see which players rise or fall in terms of 99 Club membership when Madden 20 arrives. The EA Madden folks recapped the most improved player, as well as talented rookie players from the season. NFL MVP Patrick Mahomes was clearly the guy who improved most as he nearly led the Kansas City Chiefs to the Super Bowl. Based on his sophomore season, he’ll be a force to be reckoned with for season to come. Dive into a #Madden19 ratings recap with us! In terms of rookies, Madden posted Phillip Lindsay of the Denver Broncos as their top offensive rookie. It makes for an interesting choice considering the season that Saquon Barkley put together. However, consider the fact that Lindsay started the game with a 69 and steadily improved. At season’s end, the Broncos’ running back held an 84 overall in the game. Madden’s recap also gave praise to the Indianapolis Colts’ Darius Leonard as defensive rookie of the year. Leonard and Barkley received NFL Honors cards in Ultimate Team after being winning their respective awards at the ceremony not long ago. The Madden 19 crew also highlighted good, bad, and ugly player seasons. Among the good were the 49ers’ George Kittle, Browns’ Nick Chubb, Bears’ Eddie Jackson, and Chiefs’ Dee Ford. Among the bad were the Redskins’ Jordan Reed, Cardinals’ David Johnson, and Vikings’ Xavier Rhodes. Three players from teams that missed the postseason. The worst of the worst or “ugly” seasons went to the Jaguars’ Leonard Fournette and Packers’ Clay Matthews who both underperformed this past season. Other representatives on the ugly list included Chiefs’ Kelvin Benjamin, Raiders’ Donald Penn, and Jaguars’ A.J. Bouye. It’s notable that almost every player in that group, minus Benjamin, was part of a team that didn’t make the playoffs. Check out the Madden 19 post about this past NFL season’s player ratings here. The Madden 19 video game is currently available for the PS4, Xbox One, and Microsoft Windows PCs. The post Madden 19 Player Ratings Review Looks At New 99 Club Entrants, Good Vs. Bad Player Seasons appeared first on VGR.